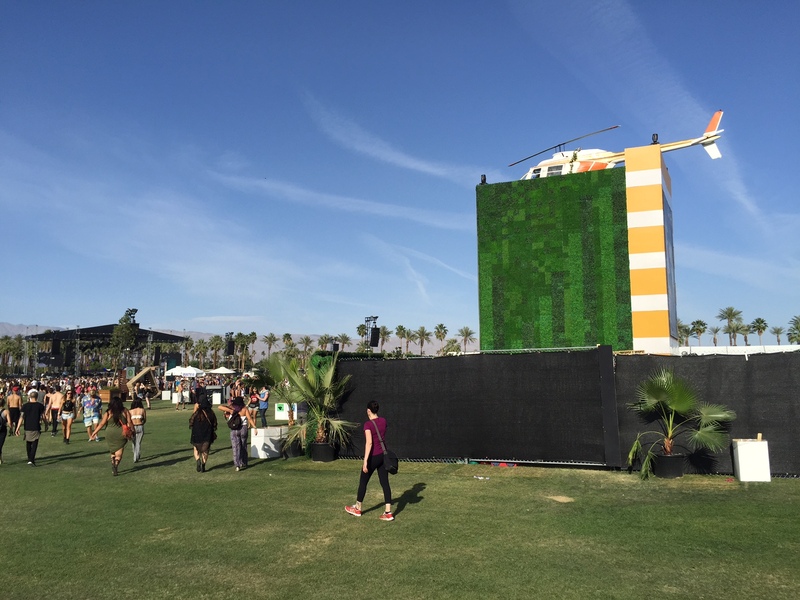 Entertainment Today scrambled the corporate helicopter to whisk me to the very center of Coachella; as you can see we spared no expense in providing you the best coverage of the 15th iteration of America’s premiere festival. With Friday starting out noticeably cooler than years past the vibe was especially calm, cool and collected. 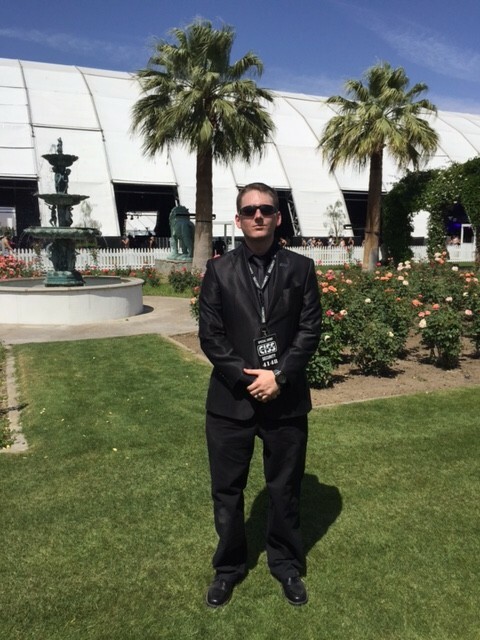 Nonetheless, several of the black suited guards in and around the VIP tents were looking a little heated early in the afternoon. Sylvan Esso was the first bursting at the seams performance of the afternoon, with folks spilling out of the Mojave tent. The band’s synth heavy sound pulsed over to the Gobi tent where Kimbra was holding court. The Gobi tent showed an upgrade from years past with chandeliers hanging from the maroon interior. Very stylish. The much loved astronaut no longer patrols the grounds, instead a large brown metallic caterpillar slithers across the polo fields. The trademark Ferris wheel has been moved a bit further away, but it still elicits a tremendous visual landmark among the palm trees and mountains beyond. Fortunately the tethered balloons remain, still casting a dreamy sight. I want to man the controls of this art installation one day. 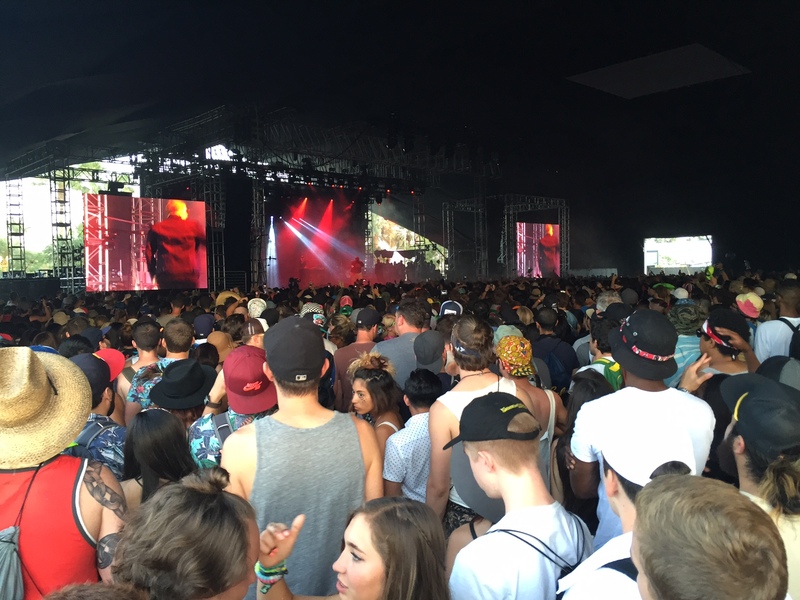 Azealia Banks mystifyingly drove a large crowd at the main Coachella stage into a frenzy. But her set ended eventually, clearing the stage for the first of the weekend’s golden moments: War on Drugs as the sun was setting and the shadows grew long. 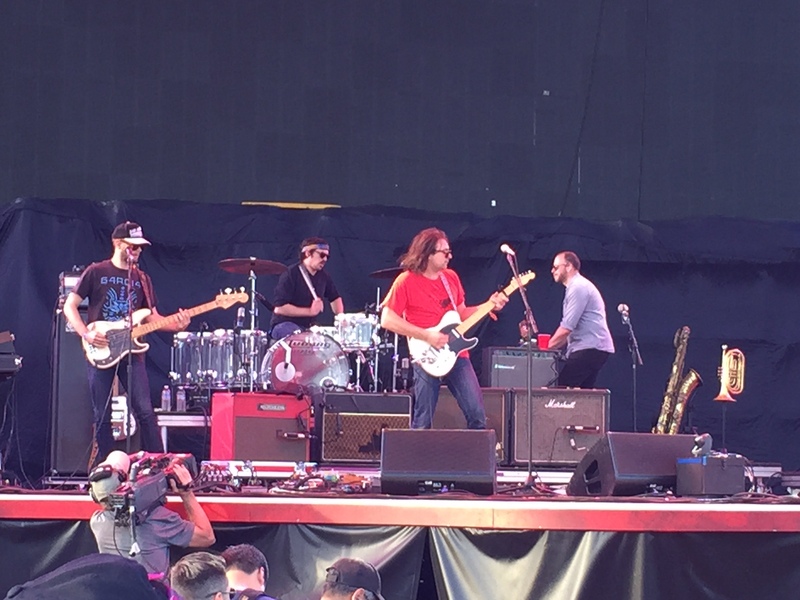 Adam Granduciel is the apparent mastermind of the band. His was essentially the only mic onstage. He switched between his Fender and his Gibson guitars, reeling off Gilmour-like solos that satiated Pink Floyd fans. His vocals were as evocative but far more palatable than Dylan’s, with a dash of Robert Smith for Cure fans. 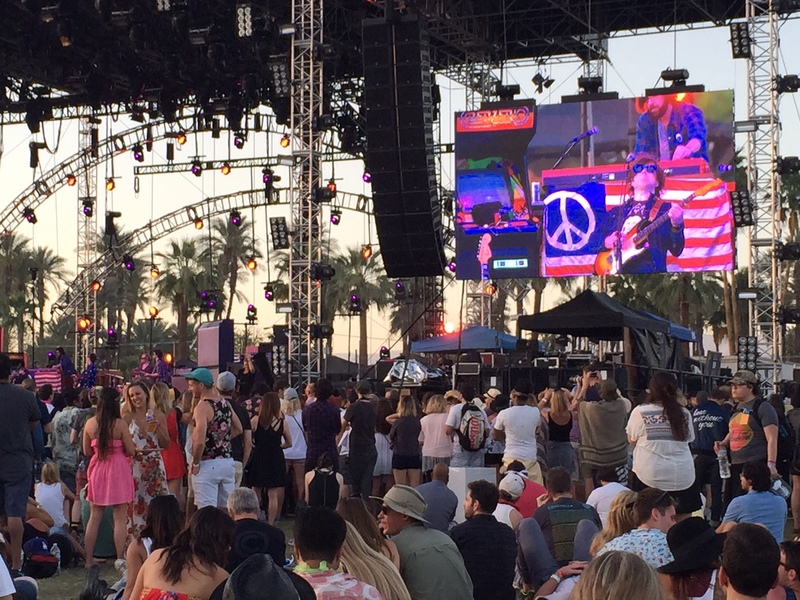 War on Drugs will see their font grow larger on future Coachella posters. No word whether past member Kurt Vile is bummed that he split the band after their first release. A quick shift to the Outdoor stage provided a blast of soulful R ‘n B via the Alabama Shakes. Crisp guitars and vibrant rhythms kept the crowd fully engaged. Many older folk stayed for Steely Dan’s set. The last time I saw them was also in the desert, at Glen Helen. 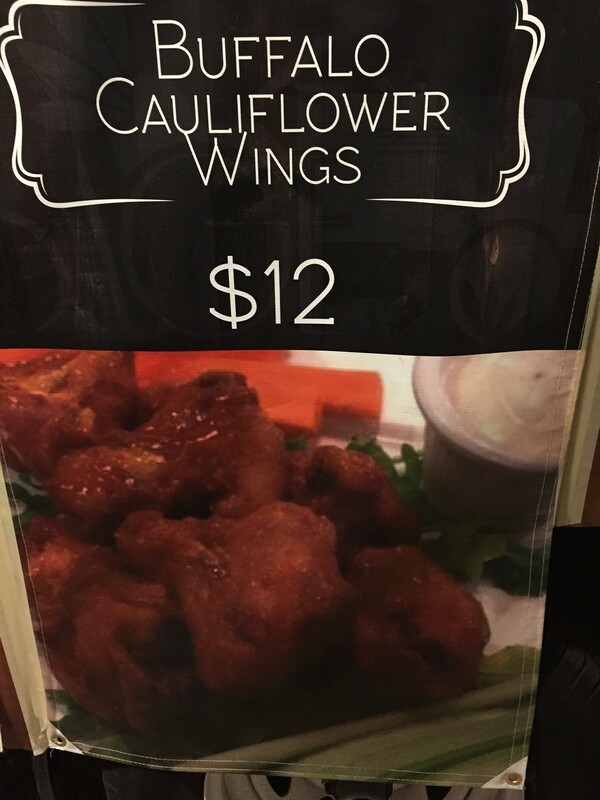 But I scooted to get a bite to eat so I will never know firsthand if they played “Bodhisattva.” I heard it plenty in college; my roommate had it on permanent rotation. 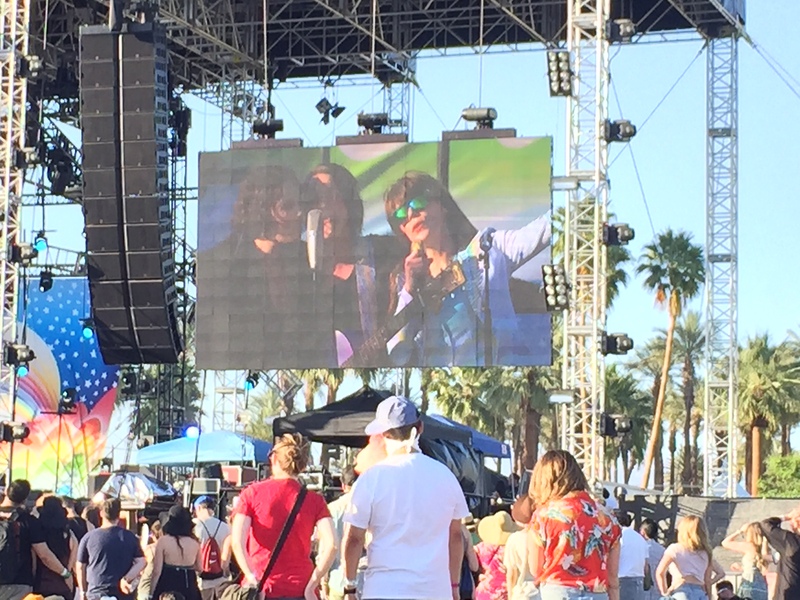 Tame Impala held the penultimate slot on the Coachella stage Friday. I had higher hopes for the band, but I did not find the music sufficiently dynamic…it all sorta blended together with no highs or lows. 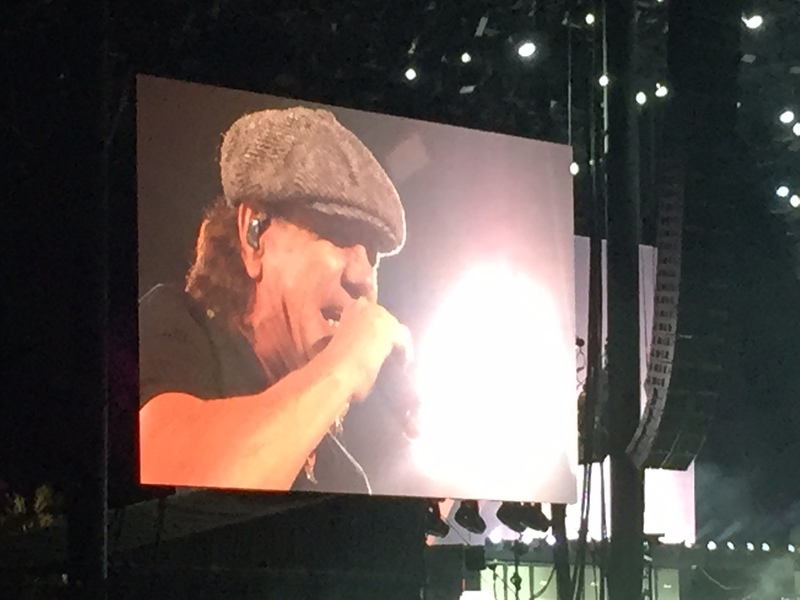 Various lighted horned heads were bobbing when AC/DC took the stage. The previously hidden Marshall amp speaker stacks were unfurled, all 48 of them. The band ripped through a scorching set of gutbucket classics and a sprinkling from their new album. 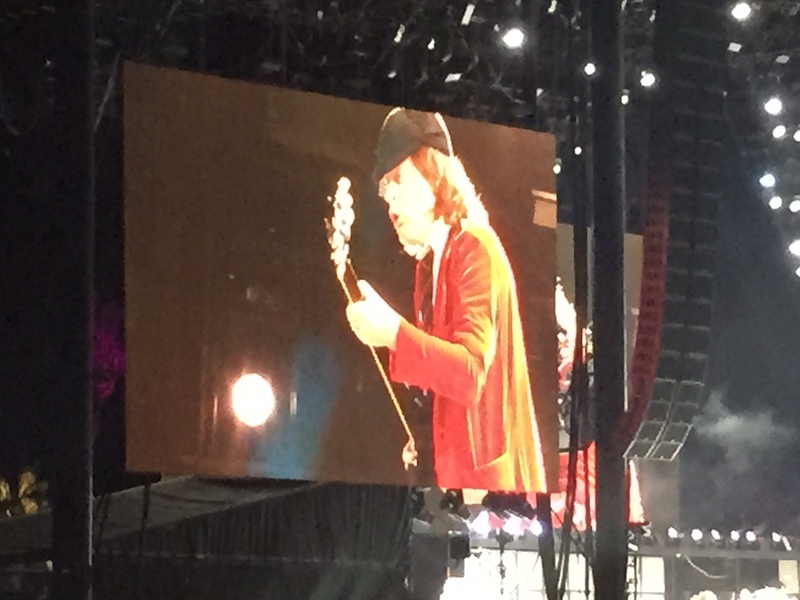 The band members collectively raised the average age of performers, and showed everyone that rocking full blast for two hours is the best way to deliver satisfaction at the end of the first night of Coachella 2015. The temperature was a bit warmer, and the folks wearing black were a bit less happy. We opted for a slightly later start, so I won’t know firsthand which small font bands are headed to larger stature. 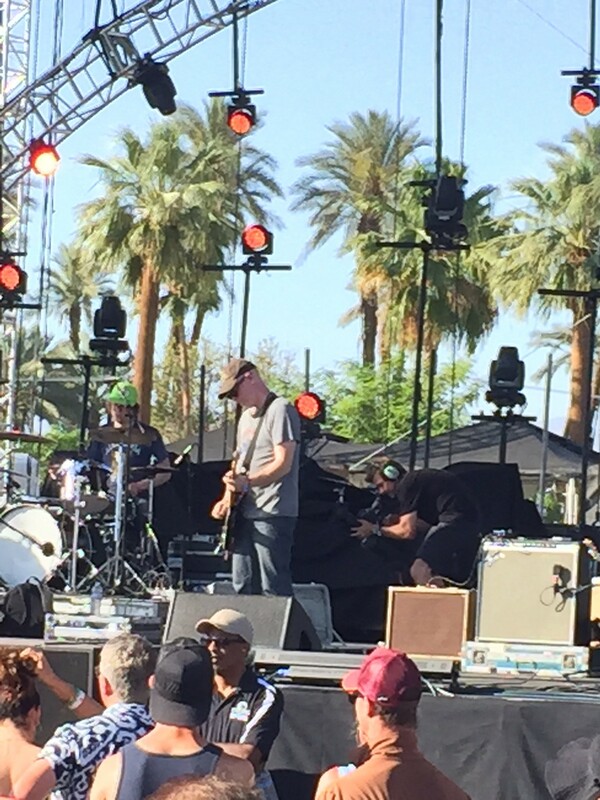 But Bad Religion delivered their improbably powerful blend of vocal harmonies and punk sensibility to the Coachella stage. Buzz saw guitars and Ramones-like beats were the sonic trademarks, until they ran 90 seconds past their allotted time and the sound man faded them out. That was a first for this Coachella veteran, as was yesterday’s last minute cancellation by George Ezra (his shirts were still on offer at the merch stand though). Another anomaly is tonight’s big font headliner Jack White not closing the Coachella stage, more on that later. Attire this year follows the look in years past. I notice about the same number of Native American headdress ensembles, more temporary gold flash tattoos and the usual array of good looking women with dorky guys. 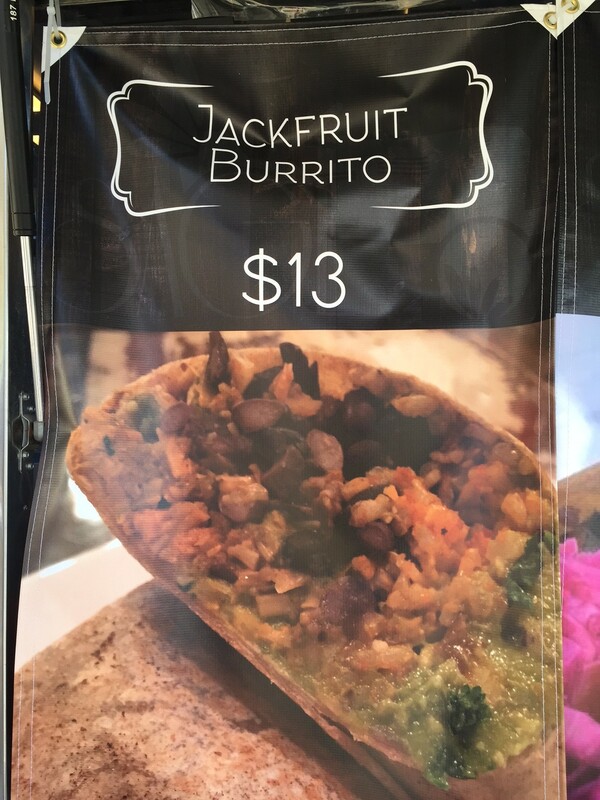 The craft food movement is in full effect, with a wide array of artisanal choices. Modern Vietnamese is represented by Phorage (one of many clever names) and filet mignon is on offer from Three Jerks Jerky. With Heineken buying out the beer sponsorship, microbrews are shut out except for one heavily visited craft beer garden tucked back on the Terrace. 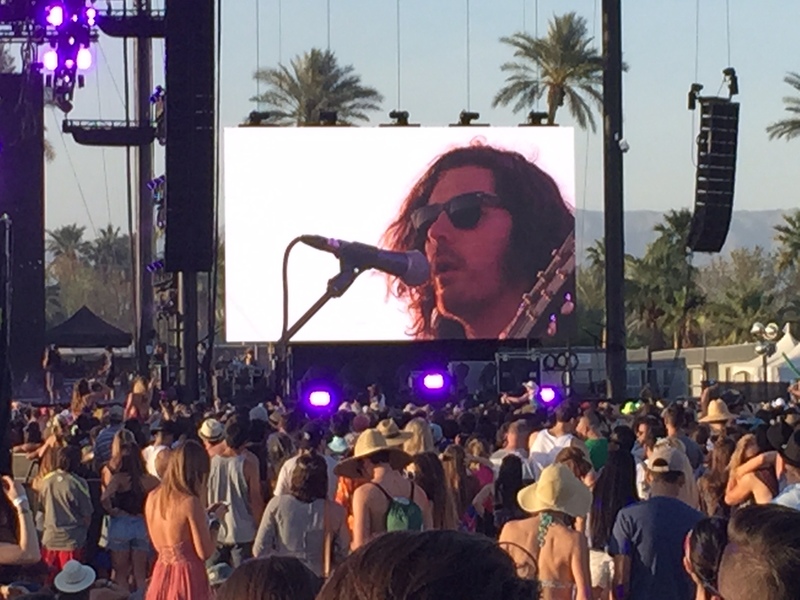 Hozier was apparently signed to play Coachella before his “Take Me to Church” became a breakout hit, which if true is a testament to the promoter’s prescience. Regardless, his manager or agent was astute to negotiate for a slot at the golden hour. 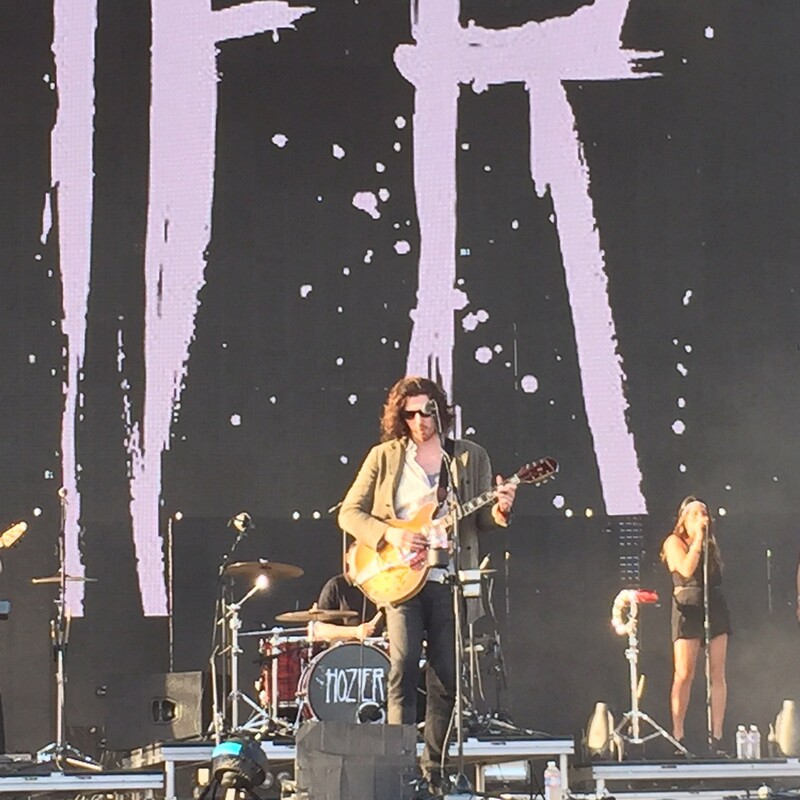 Hozier took the stage at 6pm when the shadows were long and the mercury had dropped (for digital only kids, that means the temperature was cooler). Hozier’s style was far more propulsive than “Church” would suggest. 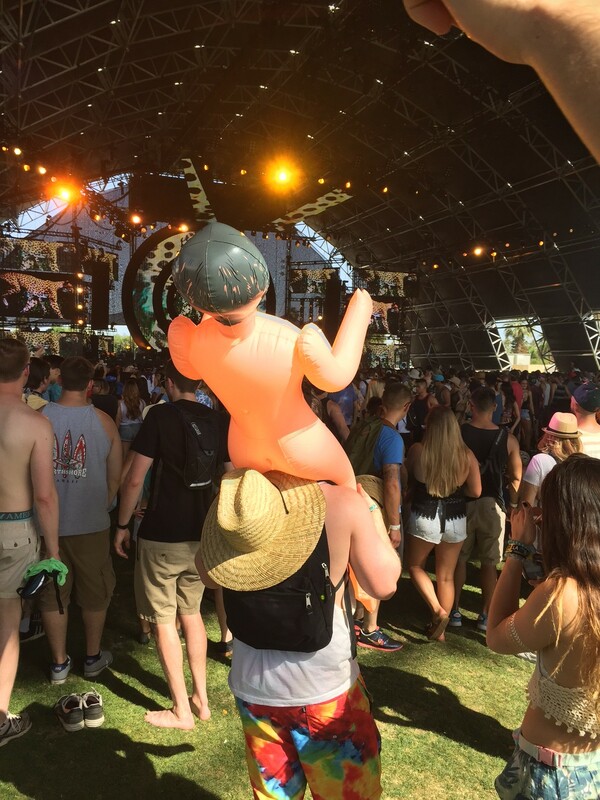 He was a perfect match for the bulk of the Coachella audience. He slowed the pace toward the middle of his set and it reminded me not unfavorably of John Mayer. And then Hozier turned up the heat for a song that could have been an outtake from Sly and the Family Stone, but was actually a cover of The Time’s “Jungle Love” with guest vocalist Este Haim. Again, not a bad thing. But the crowd roared its approval upon the familiar opening chords of “Church,” with its well timed reprise of the multi syllabic ‘amen’ just as the sun set over the mountains. Belle and Sebastian overcame their twee British reputation with a set that was more energetic than expected. Jangly guitars are almost always effective, and that was the case here. They introduced a song written especially for the occasion and it had the desired effect of bringing to their feet the folks past the second bank of speakers. The Mojave tent was packed to the rafters by fans of Run To Jewels. The duo of El-P and Killer Mike dropped bass and growling raps with confidence. They hosted a trio of guests (Zack De La Rocha, Gangsta Boo and Travis Barker), each of whom added to the frenzy. 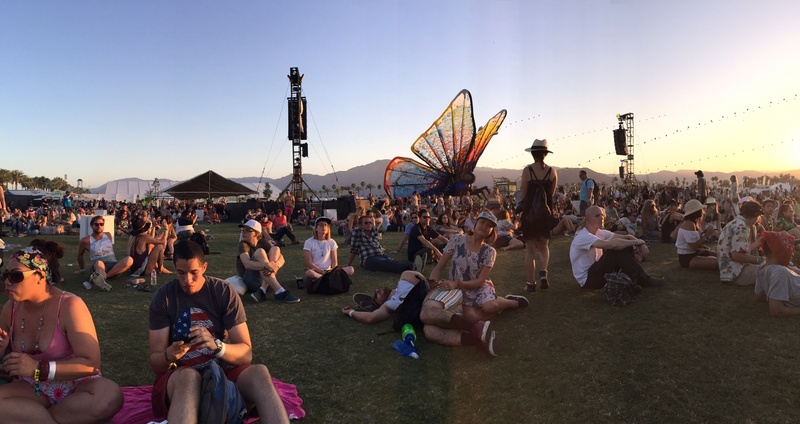 With the last wisps of daylight fading alt-J moved on to the Coachella stage. Joe Newman’s indeterminate singing language with the band’s lush harmonics and deep slabs of synth had everyone popping. Formed at Leeds University and refined near Cambridge, the band’s name refers to the result of pressing those two keys, resulting in the universal symbol of change: ∆. Myriad festival dates, a Mercury Prize, and several headlining tours resulted in alt-J moving up in font size since their last Coachella appearance two years ago. The trippy melodies of songs like “Fitzpleasure” and “Tessellate” were crowd pleasers. A great cover of Bill Wither’s “Lovely Day” had the grey haired folks nodding appreciatively. 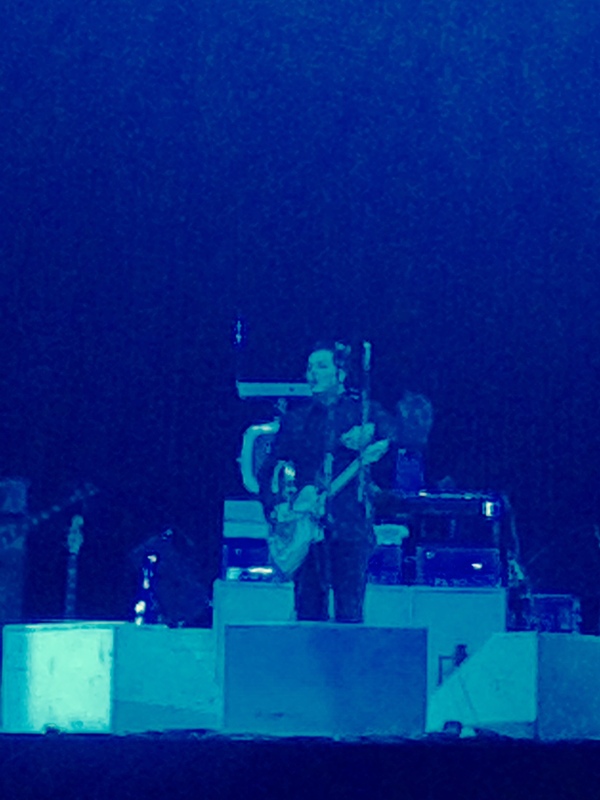 Jack White blasted on to the Coachella stage at 9:15, an oddly early time for a headliner. He is defined as the headliner in that he has the largest font size on Saturday. “Icky Thump” opened the set. His signature wiry, squeaky guitar sound was paired with a fiddle player who could not always keep up with White’s riffs. But the engine room of Daru Jones (drums) and Dominic Davis (bass) anchored the frenzy. White pulled from his solo albums (such as the eponymous “Lazaretto”) and various White Stripes songs. Then White changed it up with some country honk via acoustic guitar, stand up bass, steel guitar and fiddle. It was a veritable pre-Stagecoach hoedown. White implored the audience to put down their cellphones for five seconds and some folks did. Had he noticed, White probably would not have been pleased with the drones floating above the crowd. White praised the magic of the desert, namechecking everyone from Captain Beefheart to Jimmy Carter. The band then assembled in a semi-circular formation reminiscent of innumerable country bands and assayed “We’re Going to be Friends,” his most accessible song of the evening. Anyone familiar with Jack White knew it might get loud. Indeed, the aural onslaught became rather unrelenting. The screech of his electric guitar was pervasive, but thankfully there was some needed modulation when he slowed the pace. No doubt he is an eclectic guy, but as he led the band offstage at the end of his set he left an unrelenting wall of noise for a few more minutes. The caterpillar from Friday and Saturday blossomed into a butterfly, so folks attending only on Sunday weren’t privy to the cleverness of that art project. Built to Spill felt the first cooling breezes of the afternoon during their set on the Outdoor stage. I wish I had left the Gobi tent earlier, as I was not impressed with Desaparecidos. They had sorta goofy spoken word snippets between songs, which were done to better effect by Big Audio Dynamite decades ago. By the time I got to Built to Spill I was attracted to their soaring guitars and back to basics sound. The crowd unfortunately was rather thin, which may affect the band’s future font size. Jenny Lewis paused briefly in her set for a brave three part acapella song. Despite the inevitable sonic bleed from elsewhere, it was a nice glimpse into her roots. 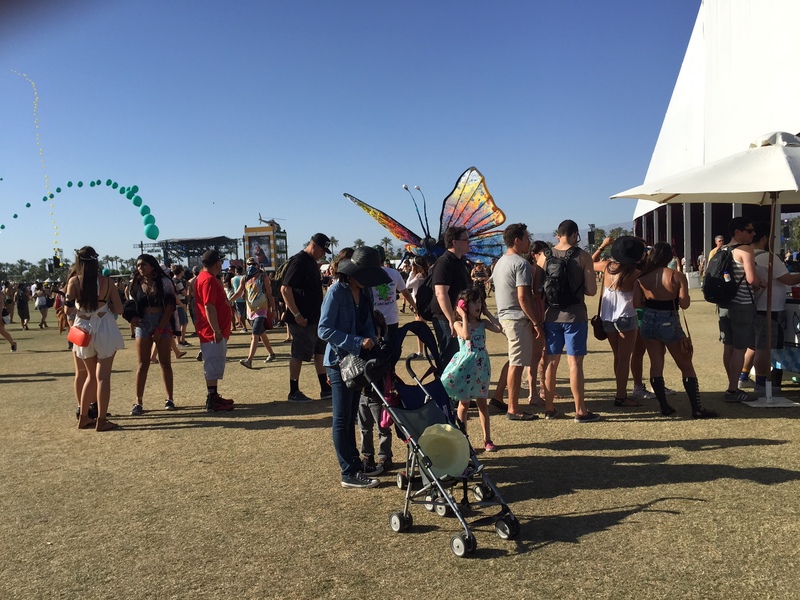 It was her sixth visit to a Coachella stage and she was vocal in highlighting the rarity of females on the festival’s lineup. Ryan Adams followed on the same stage, and he made the most of the coveted golden hour. A Woodstock-style peace flag, a couple arcade Asteroids games, comically oversized speaker cabinets and some cheesy sunglasses belied the seriously excellent music he put forth. Adams may have had one of the finest views of the day, looking out at the newly hatched butterfly, the nearly horizontal strings of balloons, with the palm trees and mountains capturing the last rays of sunlight. 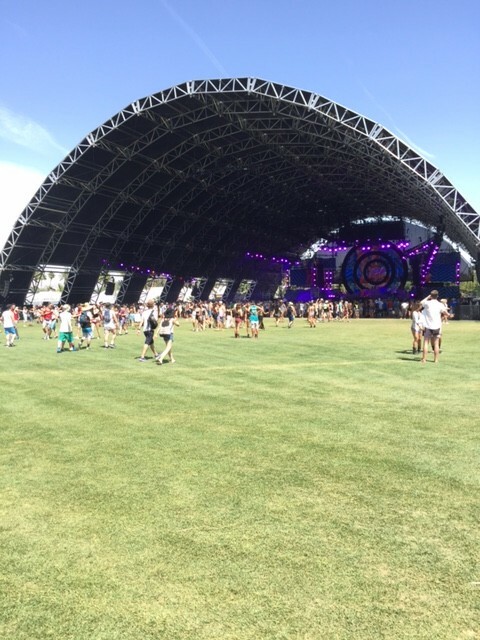 During a pause between songs Adams took a swipe at the burgeoning EDM scene at the three desert tents along his sight lines. “Is that music I hear over there? I think maybe they have an electrical grounding problem. Someone should check.” Sadly Kaskade eventually took over the Coachella stage next door, practically drowning Adams’ acoustic ballads. 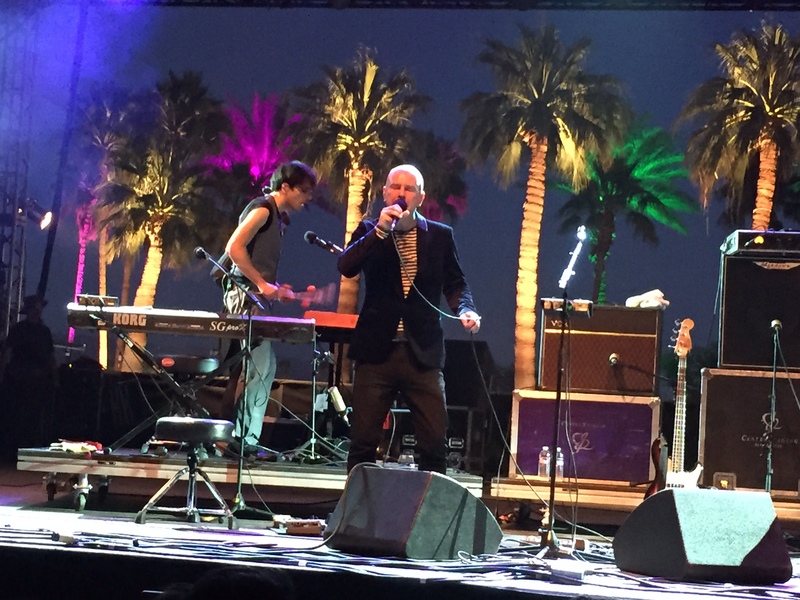 Meanwhile down in the Gobi tent Philip Selway played to a sparse crowd against an evocative and colorful backdrop of lighted palm trees. His chamber music was challenged by higher volume offerings from stages on either side, undoubtedly acting as aural magnets for punters wandering through the vacant expanse of the Gobi tent. Unlike another bald headed drummer of an artsy band who moved to center stage, Selway’s work with Radiohead has not yet translated to the success Phil Collins had with a post-Gabriel Genesis. 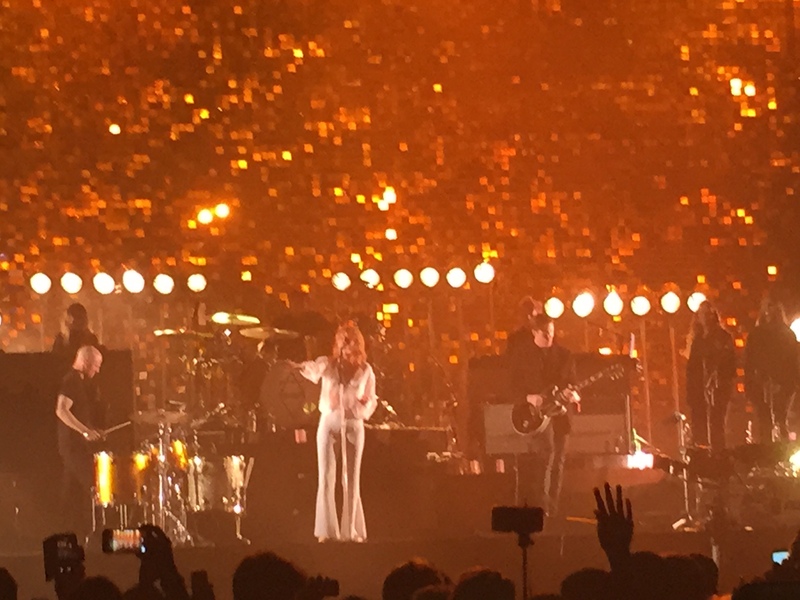 Florence + The Machine brought it big time with a brass section, a harpist and plenty of backup singers. She would have made good use of the satellite stage built exclusively for AC/DC on Friday. As it was she jumped into the pit numerous times and sprinted back and forth to get closer to her fans. She exhorted fans to remove one piece of clothing, to which many in the crowd complied. Later reports of a broken foot confirmed that she had exerted plenty of energy. 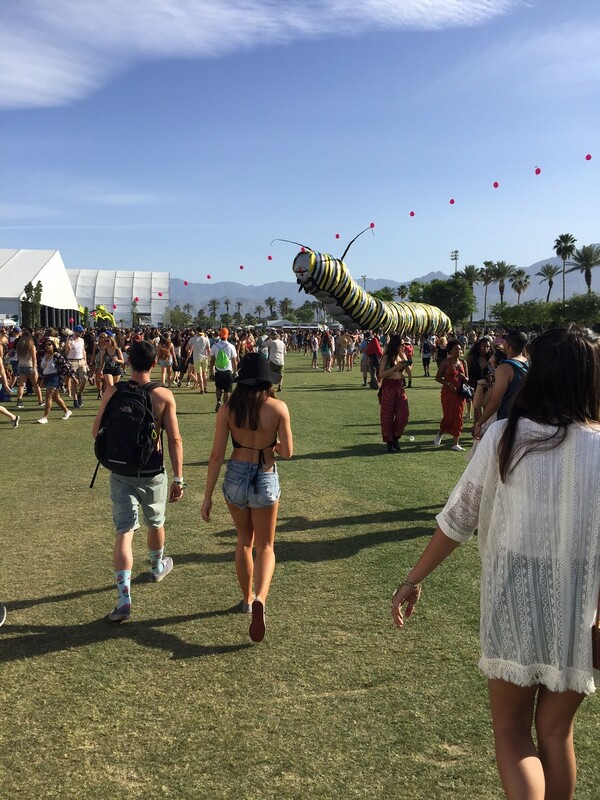 We opted to leave before Madonna joined Drake; the latter was more than 30 minutes late taking the stage and closing out weekend one of Coachella 2015. Eventually 90,000 people melted back into the night and 18 hours later most were far from Indio. But the memories and good vibrations will last a lifetime.